There are a hundred reasons why I love living in Panama City Beach, and the variety of fishing opportunities is right up there at the top of the list. Never is that more important than during tricky conditions like we are experiencing now due recent heavy rains. The waters in many parts of the bay have gone from clear to very tannic and silty. Sight-fishing is pretty much out the window for a while unless you stay outside of the inlet along the beaches where the water tends to stay a lot cleaner. The good news is, plug fishing is usually very good when clarity is less than perfect. Other benefits are that you don’t have to match the hatch nearly as closely or use as light of a leader. The temperature of the surface water in the bay has also dropped several degrees, which I’m sure is a welcome change for many fish. You can still expect to find ample amounts of trout and redfish on the flats – even with all the extra fresh water. You’ll want to start early with topwater lures that have a decent rattle to call fish in and help them hone in on your lure. Since the water has cooled off and is not as clear as usual, you can throw surface baits much longer into the day. Once the fish seem like they aren’t reacting to the surface baits, you can still switch to a jig but I would recommend using a scent attractant. Fish the bait slowly and allow the scent to guide fish to it. If the water is very cloudy, you can add a popping cork a couple of feet above your jig to help as an additional attractant. The big bull redfish are very active right now and feeding on a variety of different baits depending on their location and what food sources are available to them. Around the bridges and in the pass are the best places to target them right now. 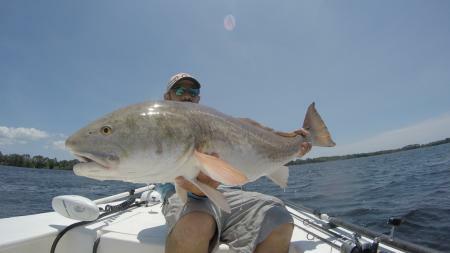 Lots of crabs are still flushing out of the bay and the big reds really love to crunch on them. There have also been some good sized reds hanging out underneath schools of ladyfish – picking up scraps that fall below the school as it feeds on mobs of red minnows and baby pilchards. A topwater plug allowed to float naturally is a good way to catch the fish that are targeting crabs, and a jig is a good lure for the fish feeding on bait schools. The mangrove snapper bite continues to be pretty consistent in the bay around docks, rock piles, seawalls, tractor tires, and many other structures. I generally catch more fish off shallower structures in water ranging from 5-15 feet but some of the bigger fish have been in water up to 25 feet. It’s easiest to chum them up to the surface and throw fresh cut or live baits at them either free-lined or with very minimal weight.